These acid free paper pages fit most 12x12 scrapbooks or sheet protectors. Heavyweight 10 pt. card stock for durability. Available in White or Black. 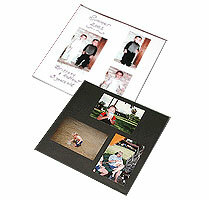 These acid free paper pages fit most 12x12 scrapbooks or sheet protectors. Made of heavyweight 10 pt. card stock for durability. These scrapbook inserts can be used with Pioneer 12x12 Scrapbook Refill Pages & Sheet Protectors or Print File 12x12 Scrapbook Preservers.